As the second week of the shutdown grinds on, I thought some data collected by DePaul professor Wayne Steger for a project on hypocrisy in ideological appeals might be informative. 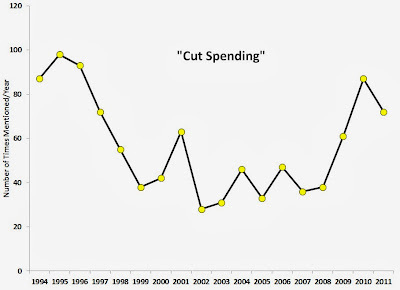 Wayne scanned the database of the National Review, an iconic conservative magazine/website, for terms indicating interest in fiscal restraint: “balanced budget,” “cut spending,” and “cut taxes.” The results suggest that the conservative publication’s interest in fiscal restraint peaks when Democrats hold unified control of government and wanes during divided or Republican control of government. 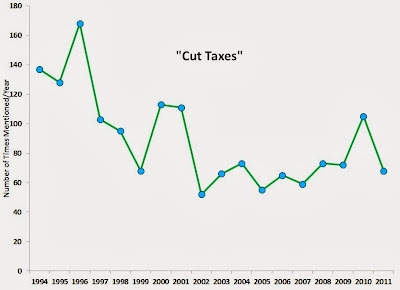 And budget reductions are not necessarily linked with calls for less taxation, which also included a peak around the election and first year of G.W. Bush. 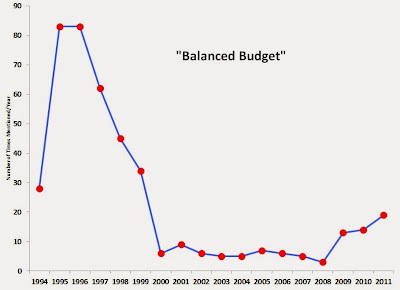 One explanation for these trends is that balancing the federal budget is not a genuine priority of conservative opinion-makers. 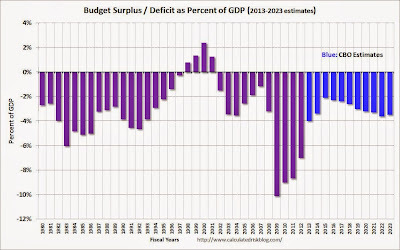 Rather, it is a set of arguments trotted out while the opposing party is making budgetary decisions (presumably favoring Democratic constituencies), then shelved when Republicans are directing federal spending (including tax cuts) toward their constituents.